May fit other years Chevy, Silverado, Scottsdale, Custom Deluxe, Sierra Classic, Suburban, Blazer (may fit Blazers, Crew Cab Truck, & Suburban to year 91). Genuine OEM GM Original Part Removed from Chevy Pickup. We Are NOT! But We Like to Eat Too! Other Things to Explore Listed Way Below. 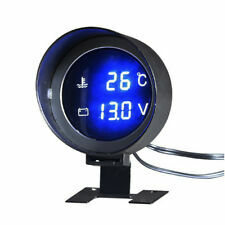 2.36" (52mm) White Face Plus Ice Cold Blue LED Background Light Display With a Magnified Tinted Lens Gauge. 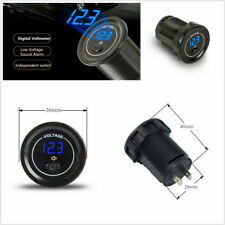 Include : 1 x Digital Volt Gauge, 1 x Instructions, 1 x Adjustable Gauge Pod. 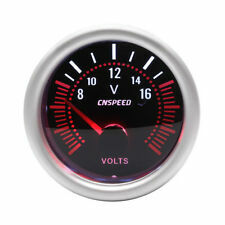 Volt Gauge White Face, Clear Lens With White/Blue LED Light. Color: Blue LED. NOTE : All of turbo parts and performance may require slight modification in order to fits perfectly. We can provide minimal support, but we will try our best to help. Smoke-Tinted Lens. Features LED Lit Back Ground For Even Lights Distribution. - Canada and International Countries. Features 7 Color Display LED Lit Back Ground For Even Lights Distribution. We can provide minimal support, but we will try our best to help. Canada and International Countries. Red Illuminated Needle. NOTE : All of turbo parts and performance may require slight modification in order to fits perfectly. Canada and International Countries. Features LED Lit Back Ground For Even Lights Distribution. NOTE : All of turbo parts and performance may require slight modification in order to fits perfectly. Canada and International Countries. P.O. BOX, PR, HI, AK, APO, FPO. Smoke-Tinted Lens. Canada and International Countries. P.O. BOX, PR, HI, AK, GU, VI, APO, FPO. A Water Temperature Gauge monitors water circulation temperature in the engine. 2" (52mm) Water Temperature Gauge. Features 7 Color Display LED Lit Back Ground For Even Lights Distribution. We can provide minimal support, but we will try our best to help. Color: Blue LED. Great for Turbo Applications. User must follow the direction given and any misuse of this product is at his/her own risk. Canada and International Countries. Red Illuminated Needle. We can provide minimal support, but we will try our best to help. Canada and International Countries. Features 7 Color Display LED Lit Back Ground For Even Lights Distribution. User must follow the direction given and any misuse of this product is at his/her own risk. Canada and International Countries. Features LED Lit Back Ground For Even Lights Distribution. User must follow the direction given and any misuse of this product is at his/her own risk. Canada and International Countries. Orange and blue backlight is shiftable. Press the side button to shift blue and orange color backlight. 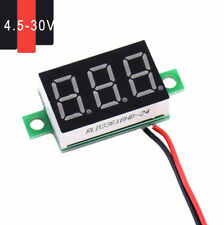 LCD display: 95mm(L) x 15mm ( W). Car cigarette power lead(12/24V). 1x Car Cigarette Socket. Smoke-Tinted Lens. Features 7 Color Display LED Lit Back Ground For Even Lights Distribution. Canada and International Countries. P.O. BOX, PR, HI, AK, APO, FPO. Display: Three 0.4 " LED Digital Tube. LED Light Color: Blue. Detail Image. Refresh rate: about 500mS. -Instruction is not included. Trending at $2.69eBay determines this price through a machine learned model of the product's sale prices within the last 90 days. Smoke-Tinted Lens. Features 7 Color Display LED Lit Back Ground For Even Lights Distribution. Canada and International Countries. 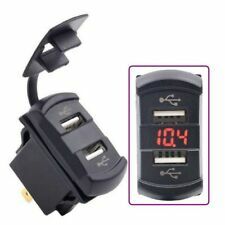 1 x Volt Gauge. Gauge Wire Length: Approx. LED super white display. Smoke Tint Lens, Red Illuminated Needle. Detail Image. 1 x Users Manual In English. We will try our best to reduce the risk of the custom duties. Features 7 Color Display LED Lit Back Ground For Even Lights Distribution. NOTE : All of turbo parts and performance may require slight modification in order to fits perfectly. - Canada and International Countries. A Water Temperature Gauge monitors water circulation temperature in the engine. 2" (52mm) Water Temperature Gauge. Features 7 Color Display LED Lit Back Ground For Even Lights Distribution. NOTE : All of turbo parts and performance may require slight modification in order to fits perfectly. A Water Temperature Gauge monitors water circulation temperature in the engine. 2" (52mm) Water Temperature Gauge. Features 7 Color Display LED Lit Back Ground For Even Lights Distribution. User must follow the direction given and any misuse of this product is at his/her own risk. 2" (52mm) Water Temperature Gauge. A Water Temperature Gauge monitors water circulation temperature in the engine. Smoke-Tinted Lens. Features 7 Color Display LED Lit Back Ground For Even Lights Distribution. Red Illuminated Needle. Features 7 Color Display LED Lit Back Ground For Even Lights Distribution. User must follow the direction given and any misuse of this product is at his/her own risk. Canada and International Countries. Red Illuminated Needle. Features 7 Color Display LED Lit Back Ground For Even Lights Distribution. Canada and International Countries. A Water Temperature Gauge monitors water circulation temperature in the engine. Red Illuminated Needle. 2" (52mm) Water Temperature Gauge. We can provide minimal support, but we will try our best to help. 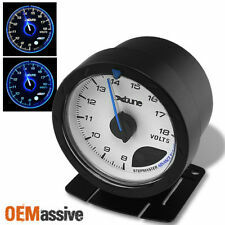 1 Piece Gauge. - LED Color: Blue. - Ambient temperature: -40° ~ 85°. 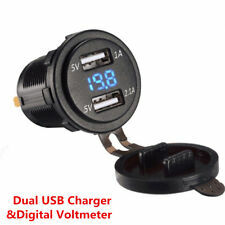 - Suitable for 12V, 24V car vehicles universal. Designed with a Smoked Tinted Lens. Color: Blue LED. NOTE : All of turbo parts and performance may require slight modification in order to fits perfectly. We can provide minimal support, but we will try our best to help.